Tromboncino squash cannot be missed when displayed on a table at the farmers' market. When I spotted it, I squealed with joy, because it is a rather rare find. I must thank The Corn Crib for growing this beauty. Besides being eye-catching with its long, curvy shape, it has a dense flesh and a delicate, pleasant flavor. Although it is harvested early and consumed as a summer squash, it does not belong to the Cucurbita pepo species like zucchini and other summer squashes, but rather to Cucurbita moschata, like butternut squash. Like its more famous relative, zucchetta has seeds only in the lower part of its body: the long neck is seedless. I cut the zucchetta I brought home into two pieces and cooked 1 1/2 pound of neck the way I describe below. The rest I roasted and turned into a soup. Wash the squash and cut it into 3/8-inch / 1 cm slices, then cut each slice into quarters (in Italian: a tocchetti), adjusting your cutting to accommodate the curves of the squash. Generously oil the bottom of a a 10 inch / 25 cm deep sauté pan and warm up, then add the onion and stir well to coat. 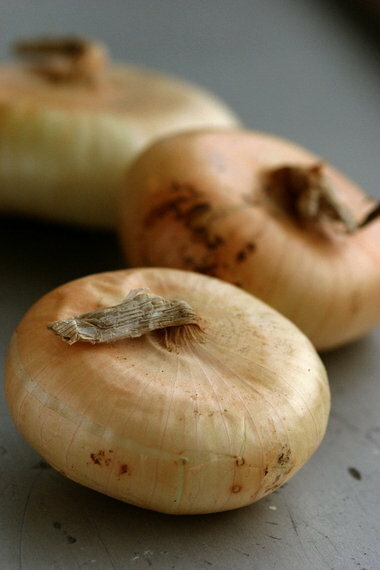 Let the onion cook on low heat until softened, then add the squash and stir well. Turn up the heat to medium-low and cook for a a few minutes, then cover the pan and turn the heat to low. Cook until the squash is tender, stirring now and then. Add the tomatoes and stir well. Continue to cook on gentle heat briefly to make sure the tomatoes warm up. Sprinkle the oregano, salt and pepper on the squash and stir well for one last time. Remove from the heat and serve. Serves 5 as a side dish. This is a flavorful side dish that brings together two of my favorite gifts from the earth. Eating it is celebrating the simple pleasures of life: fresh produce prepared with care. The monochromatic photo is my contribution to edition #146 of Black and White Wednesday - A Culinary Photography Event created by Susan of The Well-Seasoned Cook, now organized by Cinzia of Cindystar, and hosted this week by Cinzia herself. The photo was shot in color and then converted to black and white (Lightroom preset B&W Look 4). or launch the zucchetta al pomodoro audio file [mp3].